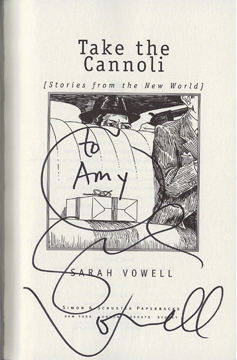 I went to see Sarah Vowell yesterday at the Brooklyn Public Library, because I was eager to lay eyes on the author of Take the Cannoli for the first time. I know, I know, it was published way back in 2000. But as with most books with titles that don’t start with Old or New and end with Testament, I was woefully behind in reading them. After memorizing line for line, verse by verse, version after version of The Book until I was eighteen, I’ve spent a decade and change trying to catch up on all the rest. Forgive me for just now making it to the V for Vowell section. I read Take the Cannoli last week. For seven days and seven nights, I dog-eared pages, penciled margins, and smeared the typeface with tears and coffee and soup. I carried the paperback with me as Good Book toting believers do. I drug out the final 219th page, not wanting it to end. I lingered on the last word, “Hon,” unsure of what to do with myself next. I didn’t want it to be over. I wanted the book to go on and on. I sat in limbo until it finally dawned on me that I could probably Like her on Facebook (I was late cracking that book too.) where I sought and found the hoped for afterlife. “The Trail of Tears?” Vowell interrupted her. “I’ve never not known that.” Perhaps sensing that the woman might be asking how she, herself, could instill a sense of history in a child, Vowell went on to acknowledge the Trail’s dramatic reenactment she wrote about in her essay, What I See When I Look at the Face on a $20 Bill, and how it was the first historical event she experienced—well, except for the Testaments—that brought history alive and communicated that the past had something to do with her. “Yep, only to you,” Sarah responded. I handed over Unfamiliar Fishes and told her my name. She autographed the $29 hardcover I’d bought expressly for this moment. When I realized what I really wanted. “And if you wouldn’t mind, this one too?” I said, shyly pulling out my crusty Take the Cannoli. “I’ve loved it for a long time,” I lied, wishing it were true and but nonetheless trying to impress my devotion, as recent converts were inclined to do. She half-smiled and proceeded to personalizethe book to Amy right in the middle of the title page illustration. My name sat next to a box of cannolis that were wrapped up with a bow on top, like a present. Sarah Vowell extended her hand and bestowed upon me the first everlasting gift I’ve ever happily accepted into my heart.